I’ve been using natural fluoride-free toothpastes for years now and although I have my favourites, I always love to try any new toothpaste brands I find online or in the shops, just for comparison. Last year I tried Weleda Salt Toothpaste (a sample) and I thought it was pretty good so I decided to try another Weleda’s toothpaste this year: Weleda Calendula Toothpaste which is suitable for vegans. If you are looking for a natural fluoride-free toothpaste that will leave your mouth clean and refreshed continue reading to see what I really think of Weleda Calendula toothpaste. I’ve received this toothpaste as part of LoveLula Blogger Accredited Program free of charge. I always provide my honest opinion about the products that I test and review on my blog. 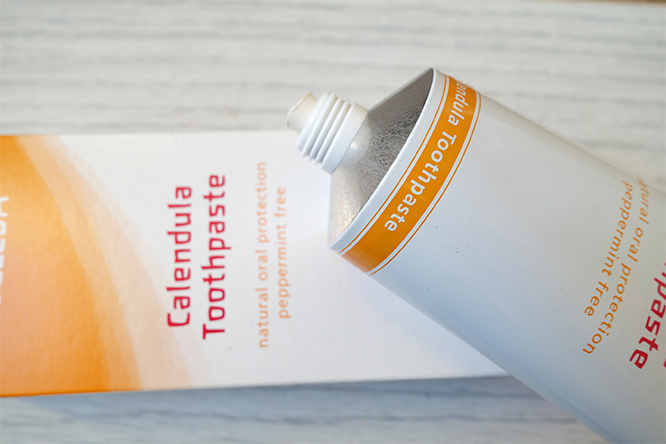 Weleda Calendula toothpaste is peppermint-free which makes it particularly suitable for those who don’t like peppermint or are allergic to it. This toothpaste is also great for those who use homoeopathic medicines – some people believe that mint may interfere with these medicines so they’d rather avoid this type of toothpaste. This Weleda’s toothpaste is made only with natural plant extracts and minerals and does not contain synthetic preservatives, flavours, colours and mineral oils. Calcium Carbonate – a common substance naturally occurring as chalk and limestone. It’s a natural teeth whitener that helps to remove stains and polish the enamel. Glycerin – naturally occurs in all animal and vegetable fats. It prevents toothpaste from drying out. Magnesium Aluminum Silicate – naturally occurring mineral derived from refined and purified clay. It acts as an emulsion stabilizer and makes the toothpaste thicker. Calendula Officinalis Extract – calendula has anti-inflammatory properties and helps soothe sensitive gums. Alcohol – the type of alcohol Weleda uses is “raw grain alcohol” which is made naturally through the fermentation of starch, sugar and other carbohydrates. This ingredient acts as a preservative. Commiphora Myrrha Resin Extract – made from the Commiphora myrrha shrub, this extract has astringent and antiseptic properties. Xanthan Gum – a type of sugar made through a process of fermentation. It helps to thicken the toothpaste and provides emulsifying properties. Ammonium Glycyrrhizate – known as Licorice Root, this natural ingredient has a sweet taste and can mask any unpleasant flavours. Flavor (Aroma)* – from natural essential oils. Not specified on a list of ingredients, but the flavour is clearly coming from fennel essential oil which you can taste very well in your mouth when using this toothpaste. Limonene – According to Weleda, Limonene is an ingredient of various essential oils that are used to improve the odour of cosmetic products. Like some other natural toothpastes, this toothpaste from Weleda doesn’t really foam. That’s because it doesn’t contain SLS (Sodium Lauryl Sulfate) which is a foaming agent better to be avoided. SLS is known to irritate the mouth and strips away the lining which can result in canker sores. What’s more, SLS can be absorbed into the bloodstream and is harmful to the environment, specifically aquatic life. You should avoid SLS if you have sensitive teeth and you get canker sores often. So it’s a good thing Weleda’s toothpastes don’t have it! If you are switching from conventional fluoride toothpaste to a natural toothpaste, not getting that foam in your mouth may feel strange at first but you do get used to it. I don’t have a problem with non-foaming natural toothpaste now but in the beginning, I wasn’t a fan. I feel Weleda Calendula toothpaste cleans my mouth really well, leaving my mouth fresh with a taste of fennel. I do like this fennel flavour in my mouth at the end, it’s definitely a good mint-alternative. I don’t know what calendula extract is supposed to taste like, but I can certainly not taste anything else apart from fennel. There is no bitterness, only maybe slight sweetness. I would personally prefer if the toothpaste was slightly thicker (the thickness of Weleda’s Salt Toothpaste is great) as I feel this toothpaste quickly gets diluted with my saliva and it’s like my teeth are not getting cleaned properly. But it’s just a feeling as the end result is great. My teeth definitely feel clean and my mouth fresh at the end. 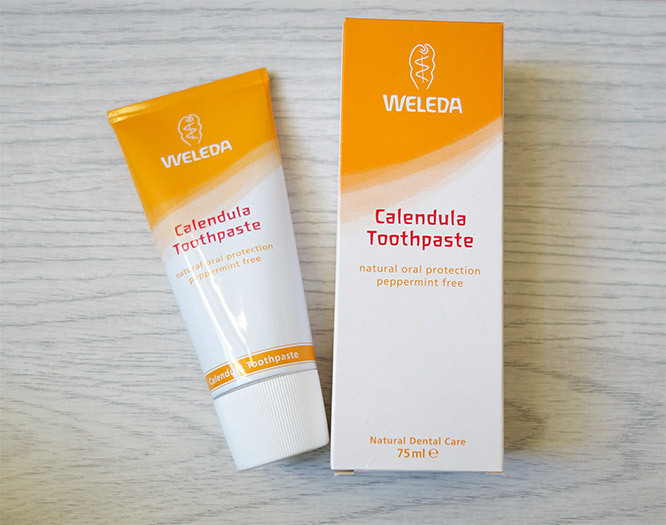 Overall, Weleda Calendula Toothpaste is not a bad natural toothpaste and I think those with sensitive gums and teeth will definitely benefit from using it. You can buy it directly from LoveLula. Full Disclaimer: This product has been gifted to me in exchange for my honest review. This post contains affiliate links which means I may get a small commission if you purchase a product after clicking on a link. This does not cost you anything.